Laura Stitzel is an independent artist in Melbourne, Australia. 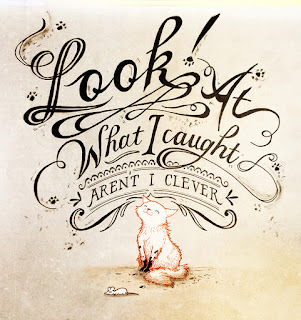 She has been working as an illustrator, designer and animator in Australia and Canada since 2007. Working mainly for children’s television, Laura was recently part of the creative team at one of North America’s largest animation studios in Toronto, Canada. There she worked on the Emmy Award™ winning "Peg + Cat," and led the painting department on "Arthur,'" the world’s longest running children’s television series. In her home of Melbourne, Australia, Laura has also illustrated and animated on a wide range of media including educational interactive projects, video games, advertisements, and television. 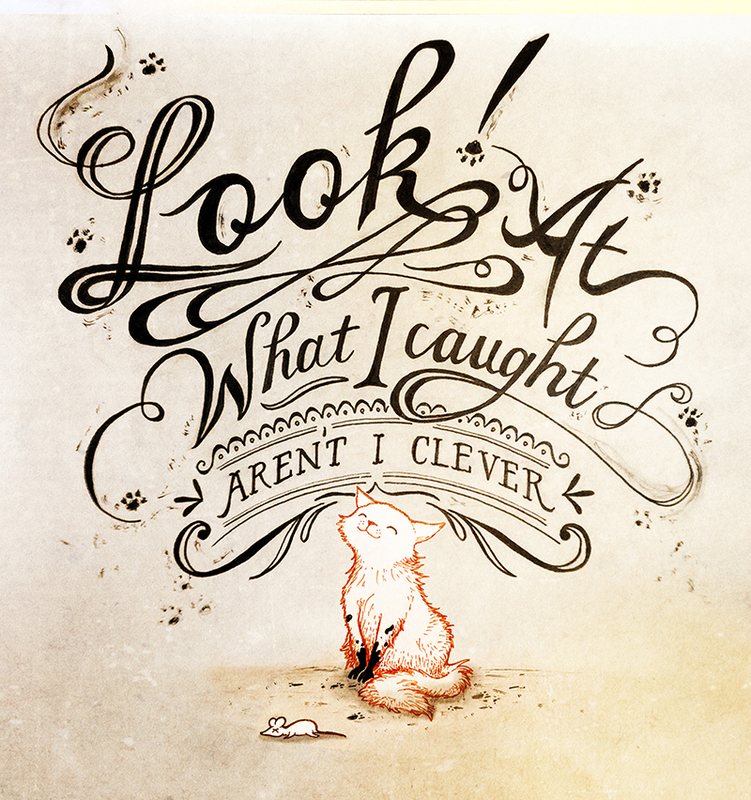 In her own illustrations, Laura’s work shines a light on animals and their place in our world. Creating artworks with a uniquely vintage style, Laura’s illustrations feature detailed pen and ink ornamentation and hand-lettering, paired with cheeky characters and cute creatures. 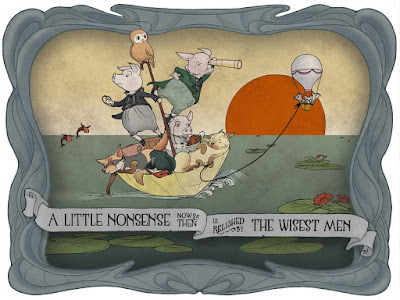 Congratulations on being awarded a SCBWI Bologna Illustrators' Gallery Honorable Mention for your illustration "A Little Nonsense"! Thank you, I’m just delighted! You have a varied background as an illustrator - can you tell us about the different types of projects you’ve worked on? My training is in animation. I’ve been working in the animation industry in both Melbourne and Toronto since 2007. I’m primarily a background artist, and I also animate and design characters and props. I’ve worked on children’s television programs as well as interactive projects and print media. When I’m not working on these big projects I like to keep creating my own illustrations that have my own style. What mediums do you work in? Does this vary depending on the type of project (print vs. website vs. television/animation)? It does vary project to project. 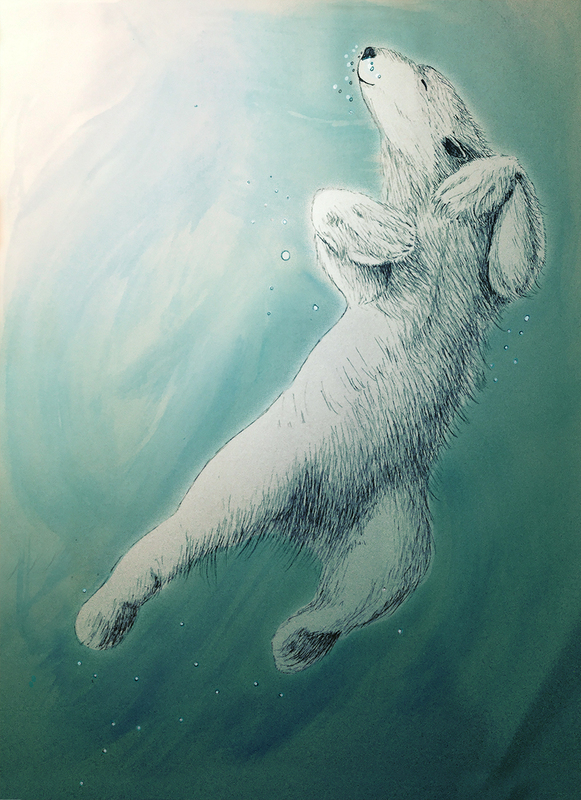 For my own illustrations, I always use pen and ink along with watercolour or digital painting. Sometimes there is no digital input at all, sometimes just for touch-ups. When I’m working for an animation studio, the process is almost entirely digital. I’m an avid Photoshop enthusiast. I love figuring out ways to imitate real painting and drawing techniques in Photoshop. This was a big part of my role on the children’s show Arthur, during its transition from cell animation to digital. I developed a new process for the painting team and created digital brushes to best recreate the original look of the beloved show. It was a great experience. Of course there are exceptions, I was lucky enough to create some artwork for "Peg + Cat," which is made using gouache and pencil and then scanned in for animation. Sitting in a modern animation studio and painting was quite surreal - and a real delight. Do you have a favorite medium or illustration tool? Absolutely - fine liners. I love using ink and I get the best results using a handful of fine liners with variations in thickness. I use black, brown and sepia. I just love that I can do both fine details and bold outlines. I’m a big fan of old fashioned rendering techniques like stippling and cross hatching. I also use a nib pen sometimes, but it’s a lot less predictable - which is sometimes a good thing. When I’m doing my roughs in pencil, my other cant-live-without tool is an eraser stick. With a ‘sharpened’ eraser, I can erase in a very fine line, which I use to carve gaps in or clean up my messy pencil line work. So it’s like I have two drawing tools - a pencil for grey and an eraser for white - genius! Can you tell us about your typical creative process? Sure. Once I have an idea for an illustration that I’m happy with, I draw a quick rough sketch to work out the story, the poses and the composition. Then I dive into references. I have loads of books of vintage advertisements and posters from the early 1900s, and I can’t do without them. I’ll use them to get ideas for a border, or a rendering technique, a font, a little ornamental decoration or even a character’s clothing. If I’m doing hand lettering I’ll often go online to find the perfect font, and I also use Google Images for references for animals. How anybody ever drew without Google Images, I’ll never know. Then I rough out my line work in pencil. I use tracing paper a lot to mirror decorative elements or shift parts around. Then, when I’m ready - I go over all my line work in pen, and do some passes of watercolour. I often draw in layers, then scan them in and assemble them in Photoshop. Lastly, I digitally apply any finishing touches. I’ll usually leave it and come back to it the next day with fresh eyes and find a few little things I want to change. Does it vary depending on what kind of project you are working on? Of course when I’m working for an animation studio, the creative process is dictated by the established style of the show, and by tight deadlines! That means there is less individual freedom, but I’m creating part of a larger vision which is immensely satisfying. However, there are parts of my own creative process that I bring to a studio environment. I’m always a believer in taking time to rough out a plan and to look at references before diving in. Taking a step back and reassessing an image’s readability is also very important. Of course with studio work I can’t always leave something overnight, but I have little tricks - such as always having the Navigator in Photoshop visible, so I can keep seeing my image at a glance and making sure it works. 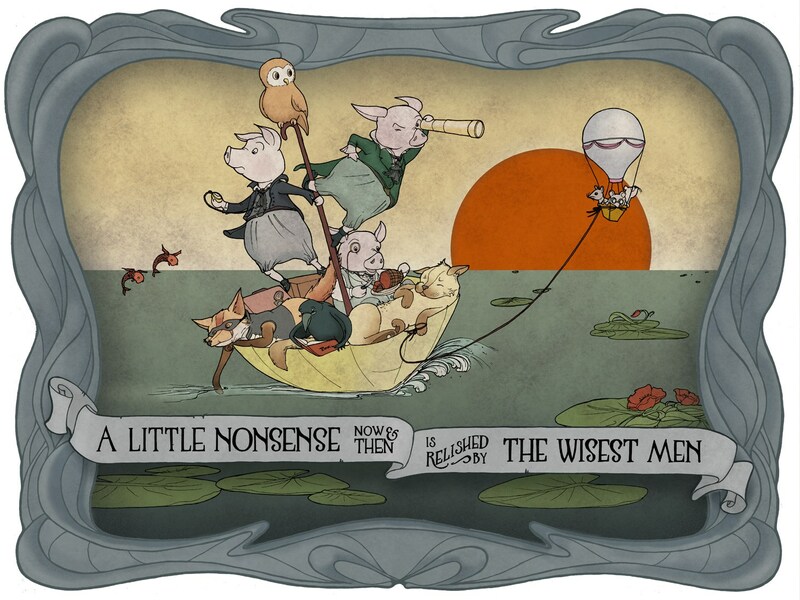 We’d love to hear more about your winning illustration "A Little Nonsense." Was it part of a larger project, or is it a stand-alone piece? This piece is a stand-alone work - but it is one of a few illustrations I’ve created using quotes from the 1971 film "Willy Wonka and the Chocolate Factory." 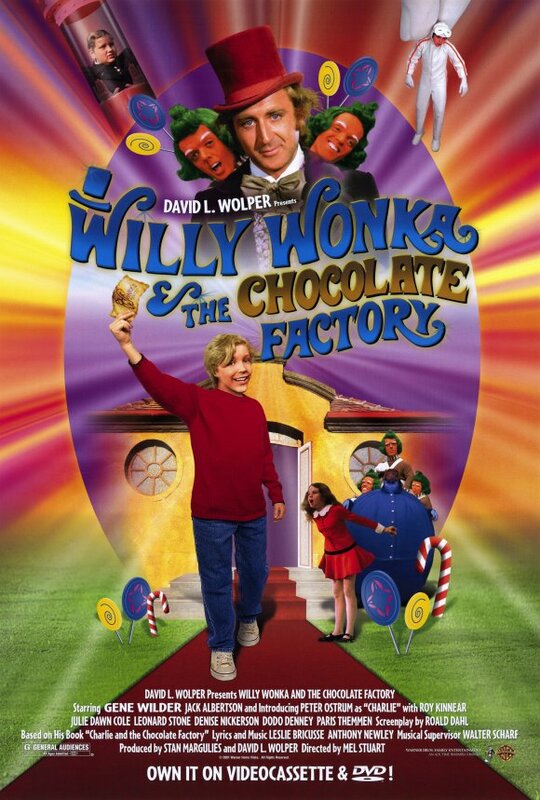 Mr. Wonka’s dialogue is smattered with literary references, and I’ve used a handful of them over the years. So I guess I have borrowed quotes from a character who borrows quotes from everyone else! I intended for the characters in the illustration to be familiar from old stories and nursery rhymes, but not specific to one film or book. For example there is a little piggie eating roast beef, there’s an owl and a pussycat, and there’s a fox in a bandit mask. They’re all on some kind of adventure together that we don’t really know about, but we might imagine it. By pairing these characters with the quote - ‘A little nonsense now and then is relished by the wisest men’ - I’m saying that imagined characters and stories mean something to all of us, they have a place in our world and they’re important. What was the medium and the creative process for this illustration? I illustrated the characters, the border and the lettering using my beloved fine liners, and painted the colour in Photoshop. 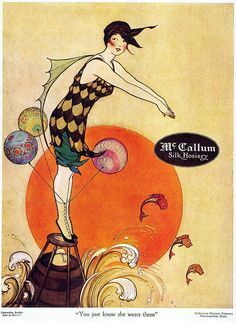 The colour palette I borrowed from a 1917 advertisement for McCallum Silk Hosiery. I love colour theory and finding out why some colours work together and others don’t, and I wanted to see if I could appropriate an established colour palette. I don’t usually reference something quite so directly - I also borrowed the sun and fish! - but it was an experiment and I’m happy with how it turned out. What is a typical creative session like for you? Just so much fun. I give myself a few dedicated hours to cut off from the world. I always put on loud music and sing terribly. I find the pencil stage makes me a bit anxious - what if I can’t get on the page what I can see in my head? But the inking stage is pure bliss - I’m in my own world, what they call ‘flow’. I usually draw way longer into the night than I ever intended and regret it the next day. Do you have a dedicated place that you like to create? No, actually I don’t! I like to move around a lot, and it’s very important to me that I can create no matter where I am and no matter my surroundings. I have a fairly portable drawing board and a laptop. In the past few years, I have traveled a lot and get my best ideas when I’m out discovering the world, so it’s important to me that I can draw and create in a variety of spaces. Some of my favourite illustrations I’ve done in a sketchbook propped on my lap on a bumpy train ride, waiting in an airport, lying in a park, or wearing earbuds in one of the world’s many coffee shops. Thank you so much for spending time with us today! I look forward to seeing more of your illustrations in the future. Find Laura on Facebook at facebook.com/lauradrawsart. Elisabeth Norton grew up in Alaska, lived for many years and Texas, and after a brief sojourn in England, now lives with her family between the Alps and the Jura in Switzerland. 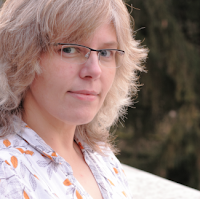 She writes for middle grade readers and serves as the regional advisor for the Swiss chapter of the Society of Children’s Book Writers and Illustrators. When not writing, she can be found walking the dogs, playing board games, and spending time with family and friends. Find her on Twitter @fictionforge. The Bologna 2016 Interview series is coordinated by Angela Cerrito, SCBWI’s Assistant International Advisor and a Cynsational Reporter in Europe and beyond.